Son of Pietro Bernadone, a rich cloth merchant. Though he had a good education and became part of his father‘s business, he also had a mis-spent youth. He was a street brawler and soldier. 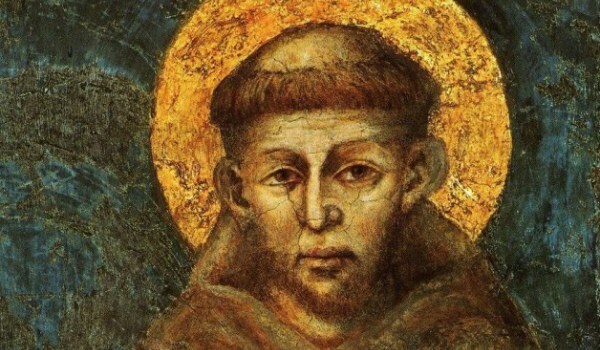 He was captured during a conflict between Assisi and Perugia, Italy, he spent over a year as a prisoner of war. During this time he had a conversion experience, including a reported message from Christ calling him to leave this worldly life. Upon release, Francis began taking his faith seriously. He took the Gospels as the rule of his life, Jesus Christ as his literal example. He dressed in rough clothes, begged for his sustenance, and preached purity and peace. His family disapproved, and his father disinherited him; Francis formally renounced his wealth and inheritance. He visited hospitals, served the sick, preached in the streets, and took all men and women as siblings. He lived with animals, worked with his hands, cared for lepers, cleaned churches, and sent food to thieves.